The Dolch Word List, or sight word list, is a list of words comprised by Dr. Edward Dolch that he found comprised the majority of children's literature. These words are some of the most common in the English language and many of the words can not be sounded out following traditional English spelling rules. Memorization of sight words is an important step in the path to literacy and we hope to bring these list words to you in a new and refreshing way. Our sight word flash cards are made with hand cut felt images that have been incorporated into the flashcard to make learning more fun and meaningful. The Dolch Word List is originally broken into levels of reading, which we have also associated with an animal to aid in memorization. This listing is for all six of the Dolch Sight Word levels in 315 cards. This set contains 315 flash cards and word lists for each level that can be reproduced as many times as you want to use with your whole classroom or family. Use the list once to hang on the fridge, or make multiple copies to use them as a means to quiz the child and track their learning progress over time. Print the flash cards twice and play a game of memory! 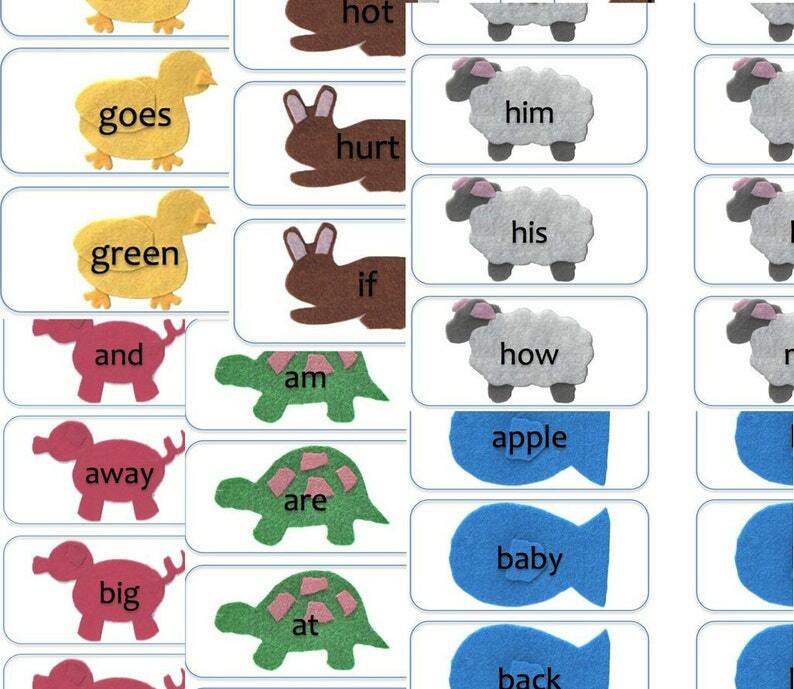 With all of the flashcards, you can build sentences, from very simple short sentences to compound sentances for advanced readers. There are endless possibilities with how you use these cards, and your child will be reading fluently in no time. These cards can be printed on regular 8.5 x 11 printer paper. No special equipment is needed! Your file will be available to you as an INSTANT downloadable PDF after payment is processed. Had these Easter eggs directly sent to my friends in WI. They loved them and I'm happy with this order too!!! Always prompt shipping and quality wooden items. and very nicely wrapped. VERY happy with my many orders!!! How do I tell you what name to put on the toy? Please leave your child's name in the note to seller section at checkout. Do you gift wrap or include a gift note? Yes! Just let me know in the notes to seller section at checkout what you want your gift note to say. Can I change the address of an order? All orders will be shipped to the address you included at checkout. Address changes will not be accepted. If you need to change your address, please send me an email so we can cancel the order and replace the order with the correct address.